At the age of 10, Ibrahim Hamato suffered a terrible accident which caused the loss of both of his arms. He had loved the game of table tennis and though it would seem pretty hopeless that he'd be able to ever enjoy it again, three years after the accident Ibrahim began experimenting with ways he could possibly do so. He tried holding the paddle under what remained of his arm, but it didn't really work. He then tried using his mouth, and with a great deal of effort and patience, he found that this worked for him. Over time Ibrahim became quite good. So good that he even competes in tournaments run by the International Table Tennis Federation. 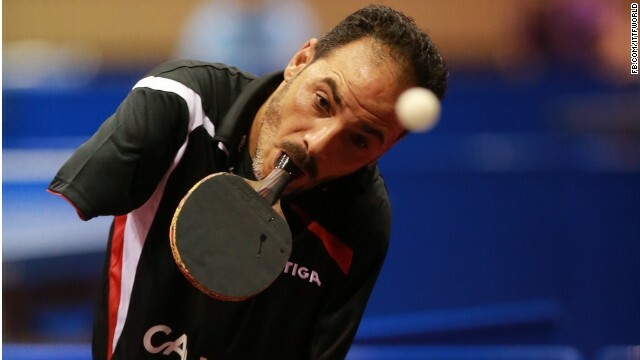 This year Ibrahim was a guest of honor at the 2014 World Team Table Tennis Championships in Tokyo. Here you can see him playing with some of the best in the world.